Dear neighbors, are you familiar with quince ? wouldn’t advise you to eat it raw, I have never heard it done. Most people have it in a pie, often in combination with apples (such as in this recipe) or make either jam, jelly, or paste (also referred to as “membrillo”) from it. Its seeds are full of pectin, so it makes sense. This pear-shaped fruit with a fuzzy coat used to grow in my garden. Yes, used to. Like me, it took a great fall last spring (still trying to figure out why) but unlike me it didn’t recover… However, I do have some steamed quince in my freezer from last year’s harvest. These days I am not into making jam so much, but I have another recipe to share with you that uses pureed quince: as you may have guessed from my exceptionally inspired title, I am talking about pancakes. This recipe is made with gluten-free oats, but I have been thinking about trying it with buckwheat flakes. It also, as often, comes with several options, all tested and tried in my kitchen : choice of flours (as I know my daughter, for one, won’t be able to find chestnut flour at a price that will agree with her student’s budget!) and also the option of adding prunes that will compensate for the binding effect of quince! On the sulfite front, I don’t think organic prunes would have any but I haven’t tested them on my guinea-pig my dear husband who is not a great fan; so the plain version is for him, well when I say plain I really mean topped with ghee butter and organic agave nectar ! Before I go on with the list of ingredients and you start thinking about making pancakes for breakfast, you will need to cook the quince. This is how I do it : I start by rubbing the fuzz off the fruit with a cloth or paper towel, then place it under running water ; then I cut the quince in halves (an operation which requires a good knife and a bit of strength… This is when I am happy my therapist has me lifting weights these days!). I then steam them for half an hour maybe ? I never looked at the clock. Note that I do not bother to either peel the quince or remove its core ; this is unnecessary hard labor, as the steaming will make both peeling and coring easier afterwards. Then I simply puree the cooked fruit before freezing it in 100 g batches. 1. The night before, soak the prunes in a small bowl of water. 2. Put the oats through a grinder and mix dry ingredients together. 3. Beat the eggs and sugar, mix into pureed quince. 4. Combine with the flour mix, and add some non-dairy milk if the batter seems too thick. Don’t forget the lemon juice (freshly squeezed from a lemon, the juice from a bottle inevitably having sulfites) to activate the baking soda, if using. 5. Cook on low (I kinda forgot to lower the heat the day I took the pictures!) after heating up a slightly greased pan with either olive oil or coconut oil, about 6 minutes before flipping the pancakes. You know it’s time when the edges look cooked and the bubbles at the surface start to burst. Batter just poured into the pan and prune bits added to my pancakes. As soon as the bubbles start to burst, flip the pancakes over. The second side takes a lot less time, 1 or 2 minutes are generally plenty! I add the cut up prunes while cooking the first side, but I suppose you can add them to the batter before pouring onto the pan. Get the coffee or tea ready while your pancakes cook and enjoy, dear neighbors… unless you decide to freeze them for those rushed mornings when you had a fight with your alarm! Then all you need is to pop them in the microwave for under a minute or so 😉 ! Just to give you a glimpse of what they look like inside. I like the fact that they don’t have much sugar and that they are moist, much more (much moister? 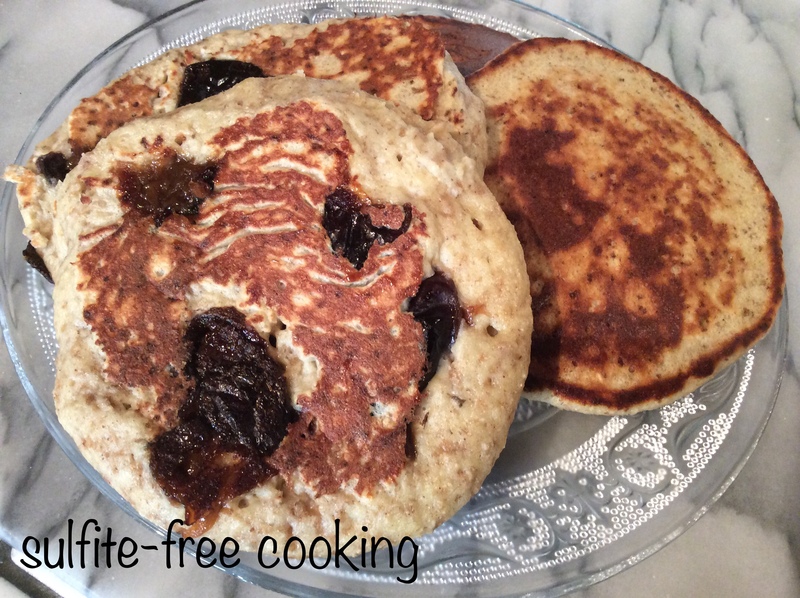 what a funny word…) than some gluten-free pancakes I have tasted. The plain version… Nothing much to say here, it’s pancakes! That’s too bad; I saw the very first quince for sale today in my organic food store. True, it does have a special taste, which may explain why people stopped eating it. Or it could be that nobody wants to make their own membrillo: it takes a long time to dry the paste over the stove, it is hard and even dangerous work, and if you don’t keep stirring, the trapped heat violently shoots up to the surface, like an erupting volcano, splattering your hand, arm, or even face, with burning paste! I remember it well. All of us home cooks deserve medals, don’t you think? Have a nice day, Kathryn. Great recipe, dear Joelle! We used to make quince compote and quince jam, but I have not seen it in stores here, other wise I would love to try your pancakes! Thank you, Dolly! I was wondering whether quince would be available in the U.S…. That’s too bad, really. By the way, I have had problems with WordPress (my comments apparently ended up in the spam bin last week 😡) so I waited till things got fixed before reading your posts. I have a lot of catching up to do! It might be available in some areas, but not in South Florida, unfortunately. My husband says they might be available in Portuguese specialty stores at least in New England. Which reminds me of an anecdote he told me: in Portuguese, the word for “quince” is “marmelo” and the quince paste you make from it “marmelada”. Imagine the surprise, and disappointment, of the Portuguese immigrants in the sixties when they opened their store-bought jar of marmelade! LOL So this is where marmelade comes from! Thank you so much for letting me know. I’ll be in Boston a couple of weeks from now, visiting my son – and my granddaughter! – and the last time I looked at the map, Boston was still in New England! I’ll task my son with looking for quince on the promise that I will make the compote and the jam and experiment making your pancakes.